Airbus Helicopters SAS (formerly Eurocopter Group) is the helicopter manufacturing division of Airbus. It is the largest in the industry in terms of revenues and turbine helicopter deliveries. Its head office is located at Marseille Provence Airport in Marignane, France, near Marseille. The main facilities of Airbus Helicopters are at its headquarters in Marignane, France and in Donauwörth, Germany, with additional production plants in Brazil (Helibras), Australia, Spain and the United States. The company was renamed Airbus Helicopters on 2 January 2014. In 2018, Airbus delivered 356 helicopters, a 54% share of the civil or parapublic market over five seats, ahead of Leonardo Helicopters (21%), Bell Helicopter (12%) and Russian Helicopters (10%). Airbus Helicopters was formed in 1992 as Eurocopter Group, through the merger of the helicopter divisions of Aérospatiale and DASA. The company's heritage traces back to Blériot and Lioré et Olivier in France and to Messerschmitt and Focke-Wulf in Germany. Airbus Helicopters and its predecessor companies have established a wide range of helicopter firsts, including the first production turboshaft-powered helicopter (the Aérospatiale Alouette II of 1955); the introduction of the Fenestron shrouded tail rotor (on the Gazelle of 1968); the first helicopter certified for full flight in icing conditions (the AS332 Super Puma, in 1984); the first production helicopter with a Fly-by-wire control system (the NHIndustries NH90, first flown in full FBW mode in 2003); the first helicopter to use a Fly-by-light primary control system (an EC135 testbed, first flown in 2003); and the first ever landing of a helicopter on Mt. Everest (achieved by an AS350 B3 in 2005). 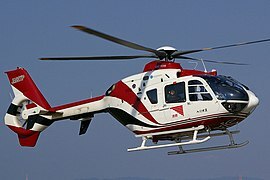 As a consequence of the merger of Airbus Helicopters' former parents in 2000, the firm is now a wholly owned subsidiary of Airbus. The creation of what was then called EADS in 2000 also incorporated CASA of Spain, which itself had a history of helicopter-related activities dating back to Talleres Loring, including local assembly of the Bo105. Today, Airbus Helicopters has four main plants in Europe (Marignane and La Courneuve in France, and Donauwörth and Kassel in Germany), plus 32 subsidiaries and participants around the world, including those in Brisbane, Australia, Albacete, Spain and Grand Prairie, USA. Since approximately 2006, Eurocopter has been involved in the planning for the proposed pan-European Future Transport Helicopter project. As of 2014, more than 12,000 Airbus Helicopters were in service with over 3,000 customers in around 150 countries. Eurocopter sold 422 helicopters in 2013 and delivered 497 helicopters that year. In 2014, AH built a concrete cylinder for testing helicopters before first flight. X³ rotorcraft – hybrid helicopter with two forward propellers, which achieved a 255-knot speed milestone in level flight in June 2011. Airbus Helicopters X6 – Two year concept study into the possible launch of an 11.5t helicopter to replace the H225. Airbus RACER, experimental high-speed compound helicopter developed from the X³, targeting a 2020 first flight. ^ "Bruno Even Appointed CEO of Airbus Helicopters". airbus.com (Press release). 14 February 2018. ^ "Legal Notice and Disclaimer Archived 12 January 2014 at the Wayback Machine." Airbus Helicopters. Retrieved on 24 January 2014. "[...]whose registered Office is located Aéroport International Marseille-Provence – 13725 Marignane Cedex – France"
^ "Airbus Helicopters sees strong sales increase in 2018" (Press release). Airbus. 23 January 2019. ^ "Landing on Air". National Geographic Adventure. 1 September 2005. Archived from the original on 2 August 2009. Retrieved 24 June 2009. ^ "Everest 2005: The Helicopter land on Everest with video: But it is good?". wayback.archive-it.org. Archived from the original on 24 February 2012. Retrieved 2 April 2018. ^ "French Everest Mystery Chopper's Utopia summit". MountEverest.net. 27 May 2005. Archived from the original on 13 January 2015. 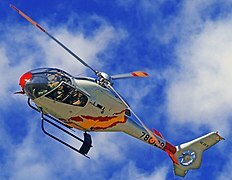 ^ "Rüstung: EU beschließt Bau von Helikopter" (in German). Retrieved 2018-01-23. ^ "HeliHub.com New dynamic testing method at Airbus brings helicopters to market quickly". 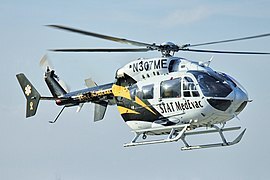 helihub.com. Retrieved 2 April 2018. ^ "Flying as one: Fully integrated Airbus takes off". Airbus. Retrieved 2019-02-18. ^ "Airbus renames fleet". Vertical Magazine. April 2015. p. 36. Archived from the original on 19 April 2015. Retrieved 11 April 2015. ^ "Civil Range" (PDF). Airbus Helicopters. 2018. ^ "Military Range" (PDF). Airbus Helicopters. 2018. ^ "PARIS: Airbus Helicopters launches X6 concept phase". 2015-06-16. Retrieved 2016-07-08. ^ "www.airbushelicopters.com/website/en/press/Airbus-Helicopters-launches-X6-concept-phase,-setting-the-standard-for-the-future-in-heavy-lift-rotorcraft_1771.html". 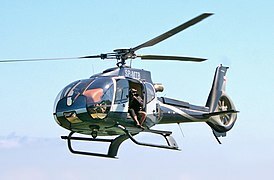 www.airbushelicopters.com. Retrieved 2016-07-08. 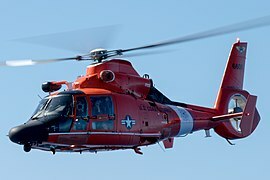 Wikimedia Commons has media related to Airbus Helicopters. Dominic Perry (20 Feb 2018). "Faury leaves Airbus Helicopters a business transformed". Flightglobal.